Last month, more than 6,000 people in prisons throughout California went on hunger strikes to protest inhumane living conditions – especially long-term isolation. Their protest followed the U.S. Supreme Court’s May ruling that found the California Department of Corrections and Rehabilitation to be in violation of the Eighth Amendment, which prohibits cruel and unusual punishment. The court’s ruling mandates that the Golden State reduce its population of prisoners by nearly a third over the next two years. In a state buckling under the social and financial weight of a gargantuan prison system that prioritizes incarceration, this could be good news: a chance to transform the way the state defines and promotes justice. What California needs is a true “realignment” (Gov. Jerry Brown’s buzzword for reworking the state budget) of the prison system – away from mass incarceration and toward the many alternatives that are less expensive and more effective. So far, the state’s plan for reducing the prison population relies heavily on simply shifting prisoners from state lockups to county jails and out-of-state rental space. But many other states are setting examples that California could follow. A recent report by The Sentencing Project notes that, to date, 13 states across the nation have closed or are considering closing facilities, reversing a 40-year trend of prison expansion. Fiscal crises have fueled the trend, but reforms in sentencing and parole policies have also resulted in less demand for prison space. “The trend of prison closings results from smart criminal justice policy combined with fiscal realities,” says Nicole D. Porter, state advocacy coordinator of The Sentencing Project and author of the report. California’s 2011 state budget, signed on June 30, finds money for “realigning” the prison system by slashing higher education and imperiling K-14 funding – a very short-sighted move if your goal is to solve the prison problem. For years, cost-benefit analyses have shown that it’s far more cost-effective to spend money to help poor kids stay in school than to jail those whose limited options lead them down less salubrious paths. From Head Start to free community colleges, spending on education reduces later spending on prisons. The same is true of things like subsidized housing and medical and mental health services. In a paper entitled “Where We Sleep,” the Economic Roundtable demonstrates that actual public spending would fall considerably were prison funds redirected to building housing for homeless people and providing onsite social workers to guide them to appropriate resources. The alternative – police, jails, courts and prisons – is much more costly. San Francisco is already combining both service and education imperatives to solve overcrowding problems without jail expansion, proving that realignment can be a creative force, instead of yet another weight depressing the people and resources of the Golden State. 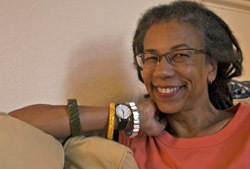 Dr. Ruth Wilson Gilmore, author of “Golden Gulag: Prisons, Surplus, Crisis, and Opposition in Globalizing California,” is a professor of geography at CUNY Graduate Center and previously taught at U.C. Berkeley and the University of Southern California. She can be reached at rgilmore@gc.cuny.edu. This story originally appeared in YES! Magazine. California will spend $7.7 billion dollars under AB900 to expand it's prisons and under Jerry Brown's AB109 another $ 5.5 billion dollars will be spent to expand jails. Can California really afford this? And is this a wise choice compared to Sentencing and Parole reform which would cost almost nothing?